It was black Saturday in Ogidi, Anambra State when the Kingsize Pharmaceutical Ltd (KP) caught fire at about 1600hrs. 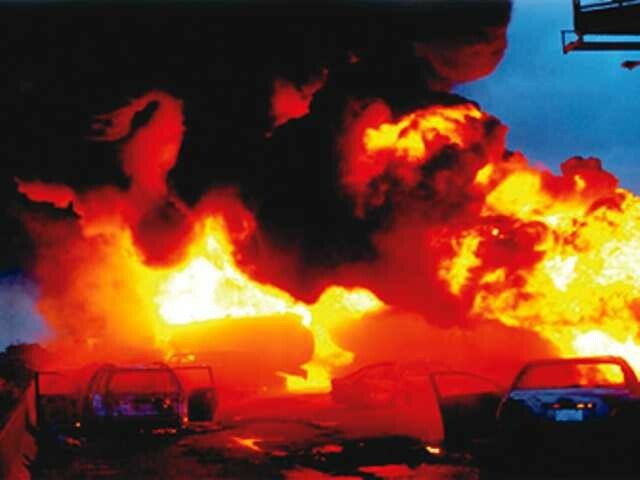 It was a fire disaster that took 12 hours to be extinguished because of the chemical components in the company. The cause of the fire is still unknown until after proper fire investigation. As Anambra State Fire Service received the distress call, four (4) fire fighting trucks (1from Onitsha & 3 from Awka) were engaged at the fire scene to fight the fire. We firefighters of Anambra State Fire Service fought the fire till about 0330hrs of Sunday morning when we disengaged from the scene of fire. I wish to thank the general public who were trying and giving their best to stop the fire before the arrival of the men of Fire Service. I wish to also thank that those that called to inform us of the fire outbreak. To the owner of the company, I pray God to you the grace to bear this great loss. On our arrival, we fought like we have never fought before. Although, properties that worth millions of naira were lost to the fire outbreak but at the same time properties billions of naira were saved. May I use this opportunity this medium to ask the general public to avoid anything that can cause fire outbreak as we are in the dry season. Clear bushes that are around your building at least about 10 feet away from your building. Your fire extinguishers should be very active and functional at this period. Put off your electrical and electronics gadgets when it is not in use to avoid power surge. Always remember to call on Fire Service IN TIME because a stitch in time saves nine. Avail yourself of all emergency numbers at this season. Whether you need them or not. But one thing is clear; you will need it someday. You can as well dial 112 in Anambra State and the call will be redirected to fire service or police or ambulance BUT it is important that you have the direct contant of fire service. If you are not in Anambra State, avail yourself the opportuity of getting the number of the nearest fire service station closer to you. FIREFIGHTERS are your friends and ever ready to give a helping hand in the times of distress. The only thing you owe them is to call them in time. Even as you are preparing and celebrating your Christmas, firefighters will always be around to protect and save your properties. I am a firefighter and fighting fire is my job.